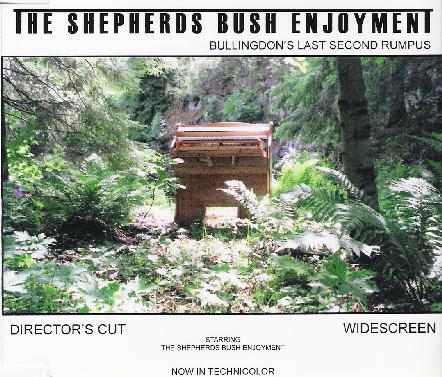 The Shepherds Bush Enjoyment - "Bullingdon's Last Second Rumpus"
With a name like The Shepard's Bush Enjoyment, you might think these guys are a new British band, but this duo comes from Sweden (their name is somewhat explained on their web site). TSBE crafts a driving, rhythmic, melodic rock sound deeply inspired by late 60's/early 70's rock. Sweden has been a real hotbed of progressive and space rock over the last ten years or so, and while TSBE does incorporate some elements of prog and space into their music (one of their songs is a 20-minute long epic), the music on Bullingdon's Last Second Rumpus is more blues based than bands like The Flower Kings, and draws more on influences like Deep Purple, The Doors, and The Quicksilver Messenger Service. One exception though is the stunning instrumental New Age of Reason, which is a rhythmically complex excursion, with timpani, Mellotron, weird soundscapes, voice samples, and acidic guitar. Other standout tracks include the Beatles inspired psychedelic rocker Some Great Reward, with lovely electric piano and touches of funky horns, and of course the epic Gamblers Award, which successfully weaves many of the duo's influences into a great big, multi-faceted but very tight sound with all round great instrumental chops (including some nice King Crimson like guitar work) and cool vocal harmonies. Very impressive and highly enjoyable! For more information you can visit The Shepherds Bush Enjoyment web site at: http://www.studioff/tsbe.